Vultures are frightening looking birds, but I’m pretty pleased with this one I snapped zipping across the Delta floodplains in Botswana, Africa. Hey, ho. This African bush elephant, also known as the African savanna elephant was right onto me when I pointed my camera at it. I was ready to hide behind a huge tree – not a little tree. 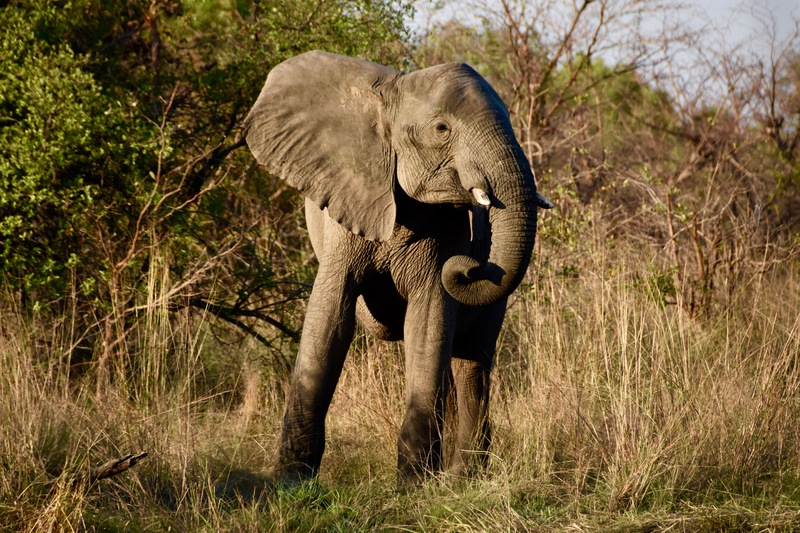 The African bush Elephant, is the larger of the two species of African elephants, and the largest living terrestrial animal. These elephants were previously regarded as the same species but studies proved that to be wrong. I knew that. Hooray. 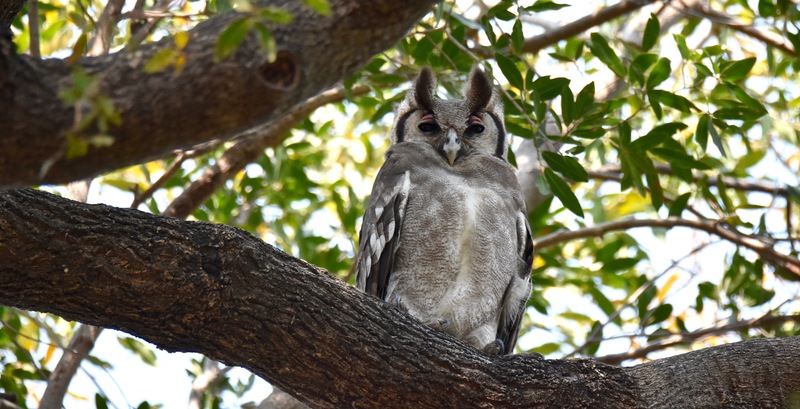 How wonderful it was to see this magnificent Verreaux’s Eagle-Owl while on a long walking safari at Camp Okavango on the Delta floodplains in Botswana. It is the largest owl in Africa. Without my 600mm lens I would not have been able to successfully snap this image. Hey, ho. Female baboons refuse to give up their young after they die. The baboons believe they could come back to life. They will carry the dead infant until it decays – then it is left for the vultures. That’s very sad indeed. It is rare for someone to photograph this type of behaviour – but I got lucky. I snapped this picture in the Delta floodplains near Camp Moremi. 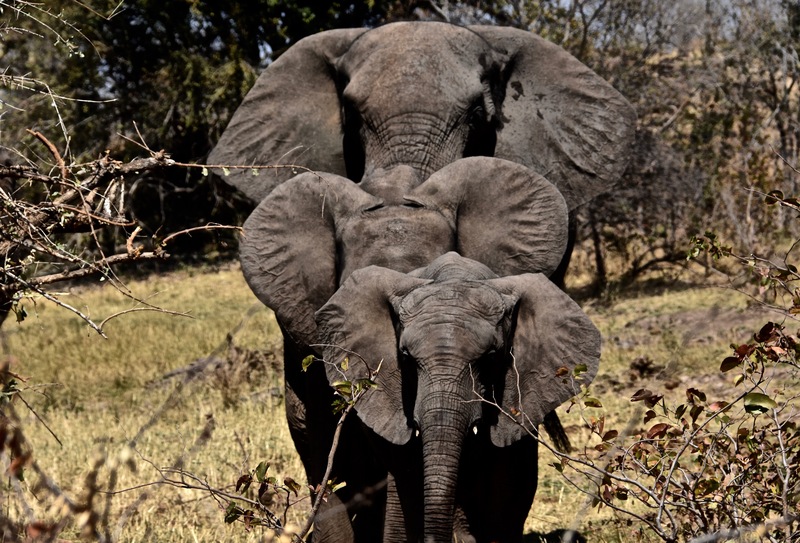 I saw these African Elephants coming towards me at the Elephant Camp in Zimbabwe, so I decided it was a perfect opportunity to keep shooting pictures until their ears were all up and flapping together. I shot fifteen frames with a 18-300 mm lens before I decided their ears were all up and flapping how I wanted them to be. Then I scampered off. A lucky shot. Yippee. 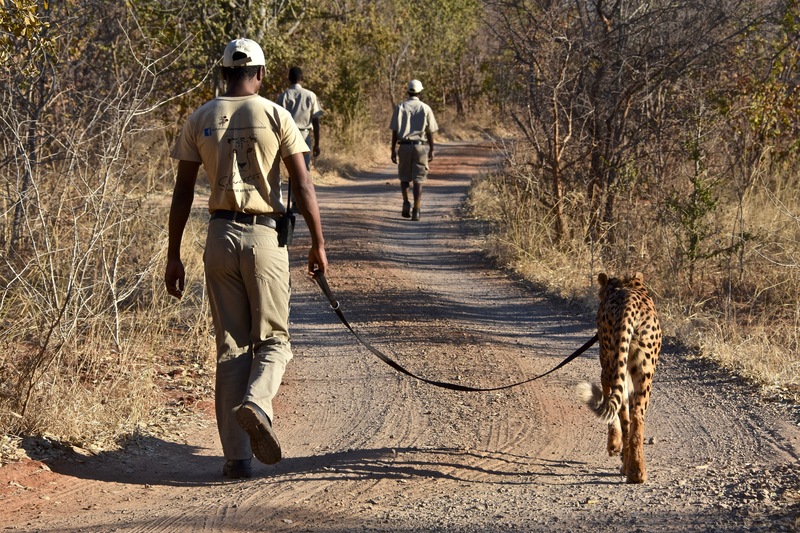 More than seven years ago the good people at the Elephant Camp in Zimbabwe adopted an abandoned cheetah cub. They named him Sylvester. As soon as Sylvester opened his eyes he believed the people who held him in their arms were his family. Now, every day Sylvester is taken for a walk into the wilderness. When he is far away from the camp, he is let loose and goes on the hunt for buffalo or any animal he desires. Sylvester has never caught anything – but he runs until he is totally exhausted. As soon as he’s caught his breath he returns to his family. Life goes on. Yippee. 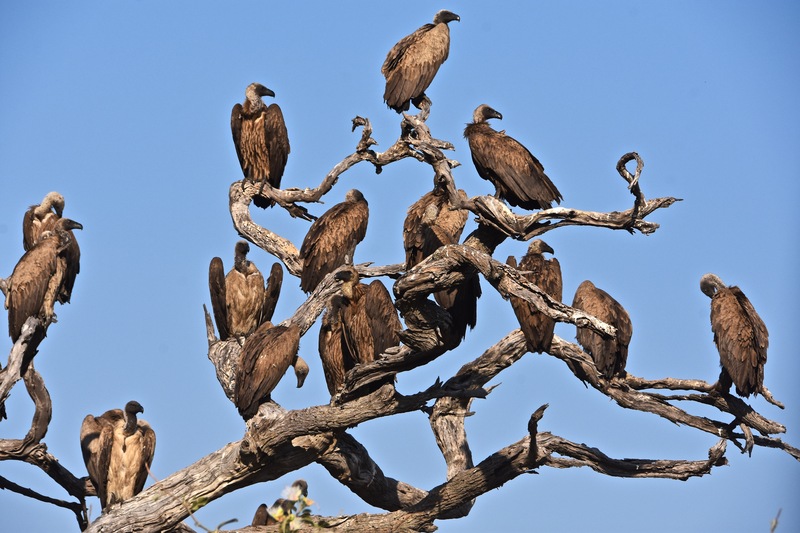 The vulture tree in Chobe National Park in Botswana, Africa. As it was the first time I’d ever seen vultures in the wild, and knowing what they were waiting for, it was a frightening sight. There were dozens more vultures circling in the sky waiting their turn for a feed. I was totally in awe. My hints and opinions when on safari. I have been on more than a dozen safaris of different types since I’ve been in Africa so I am able to inform you what you might expect. *On safari in a truck, do no sit in the back seat which is over the axle. The roads are so bumpy your back, knees and bum will be stuffed in no time. I’ve been there done that. My buttocks will never be the same. 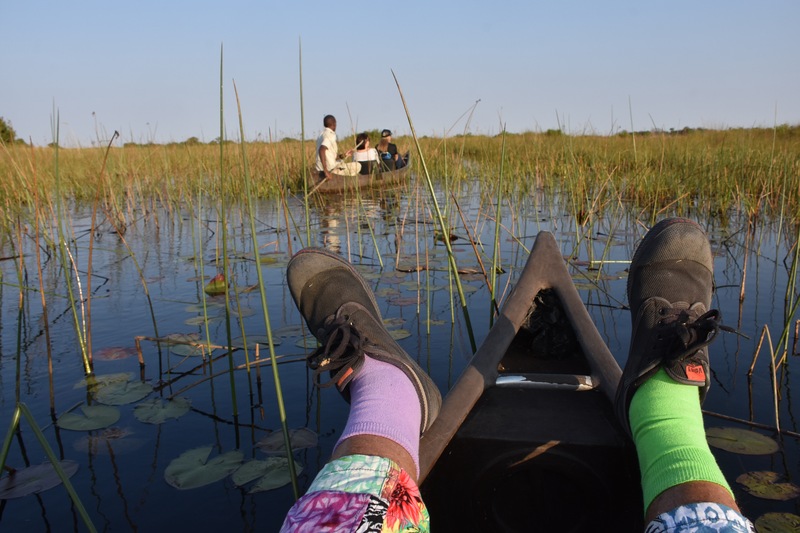 *There is no need to buy expensive clothes and boots that blend into the colours of the bush. I proved that at four different camps by wearing bright coloured clothes all the time. *Do not expect to see wild animals every day. You may never see the “big five”. It’s the luck of the draw. You may not see a kill or anything as “exciting” as that. However, many tourists get to experience that (and you should hear them brag). I didn’t see anything like that. And I didn’t see any photos. *There are early morning starts and many late nights so get yourself (reasonably) fit. Start walking now and see your doctor (even it is only to see the nurse). *Be prepared to pile on the beef. Watch your gut. To resist the top tucker and alcohol would be a bloody sin. *Be patient, relax, and enjoy the amazing colourful wilderness and the sweet sounds of birds and scary sounds of wild animals. *Gin and tonic is essential during morning and afternoon safaris. *You will always see an elephant or two somewhere. Some are so close you can almost touch them. Some are so far away you need binoculars or a telephoto lens to see them. *If you want half decent images, apart from a small lens on your camera, you need a decent telephoto lens. At least a 300mm or 400mm lens. If I didn’t take my 150-600mm lens I would have been stuffed like a Impala trapped by a crazed hyena. *Do not walk from your camp during the night without an experienced guide. Some wild animals sleep at night, but some love to hunt. Don’t risk your life for the sake of a stroll. I’d hate you be eaten by a grubby mad warthog. They tend to go straight for the throat or the testicles. *On one of your trips in Africa make sure you stay at Chobe Game Lodge in Botswana for at least three days. *For any person or photographer who are desperate to snap great images you will need at least a few months in Africa and go on as many game drives as possible. It just doesn’t happen when you want it too. *If you can afford it, you can also hire your own personal guide. 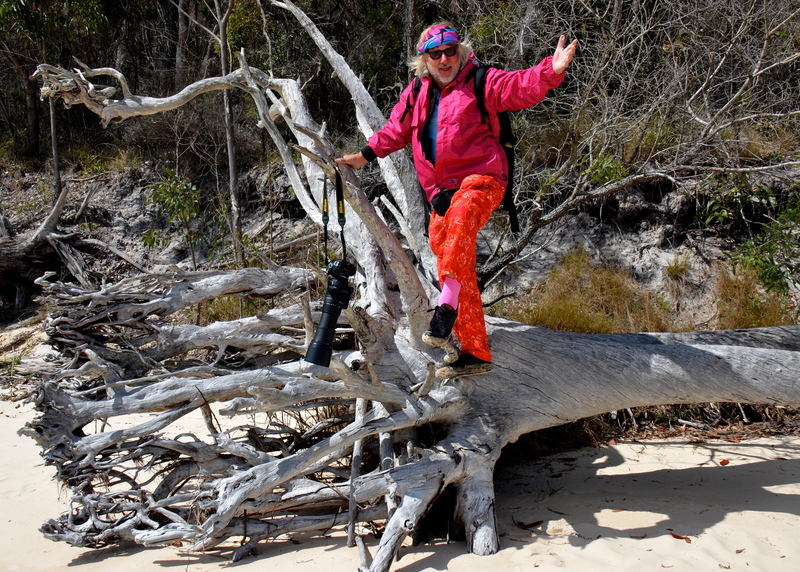 (Get a guide that doesn’t talk so much about animal tracks and animal poo). *On safari, or in your camp, wherever you go, you will meet the most kind and beautiful people you could ever imagine. PAW NOTE: There were tears each time I left a camp to travel to another. Bloody fantastic. 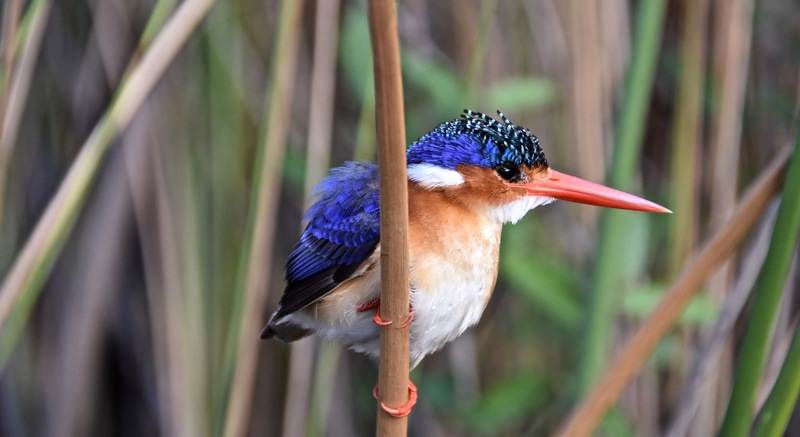 I snapped this beautiful Malachite Kingfisher in the Delta floodplains of Camp Okavango, Botswana, Africa. The kingfisher has regular perches or stands from which it fishes. These are usually low over the water. It sits upright, its tail pointed downwards. It drops suddenly with a splash and usually returns at once with a struggling captive. Large food items are beaten on a bough or rail; small fish and insects are promptly swallowed. A fish is usually lifted and carried by its middle, but its position is changed, sometimes by tossing it into the air, before it is swallowed head downwards. Fish, aquatic insects, and crustaceans are eaten. The kingfisher is wearing some of my favourite colours. 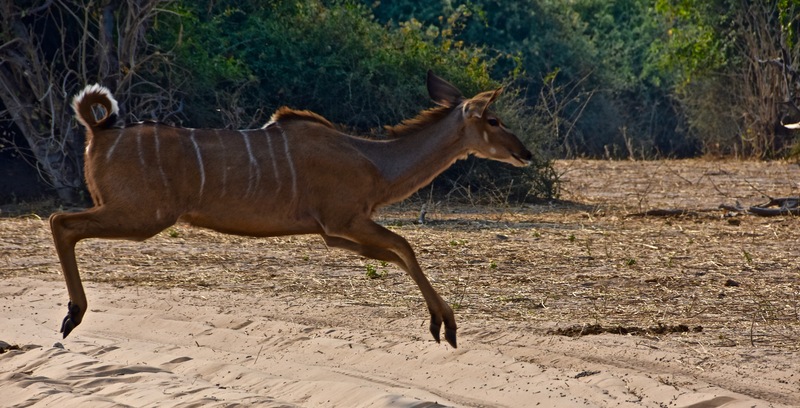 KUDOS FOR THE KUDU: It was the delightful safari guide, Ano, from Chobe Game Lodge in Botswana, who told me this female Kudu might jump across the track. I didn’t think it would, but I set myself up accordingly. I couldn’t believe it, when the big healthy beast leapt across the track and galloped off into the wilderness. I snapped four pictures of the action from start to finish. I asked Ano how she knew that would happened and she just giggled.